ahdhanRE AmARu – isn’t that, the correct way? 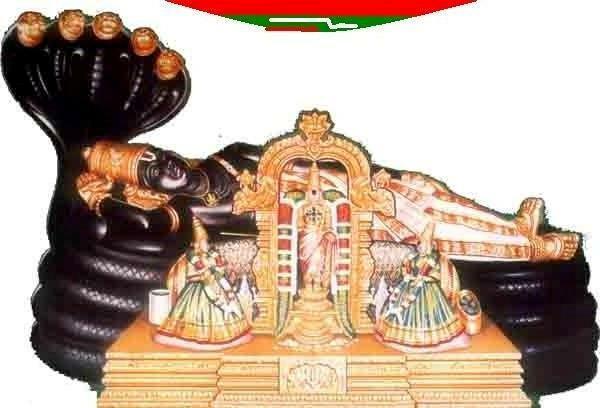 emakkuyAm viNNAttukku uchchamadhAm vIttai amaiththirundhOm – We had desired for us, paramapadham (SrIvaikuNtam) which is above the worlds occupied by brahmA, rudhra, indhra et al. ahdhanRE AmARu – Isn’t that the way that we should be? AzhwAr says further “He, who removed the hurdles which prevented him from attaining nappinnaip pirAtti, will remove those hurdles”. amaippolindha menthOLi kAraNamA vengOttu EREzhudanE konRAnaiyE manaththukkoNdu – AzhwAr says that since he has kept in his mind kaNNan (krishNa) who killed seven bulls which had sharp horns, simultaneously, for the sake of nappinnaip pirAtti, who has soft shoulders resembling bamboo, his hurdles would suffer the same fate which those bulls suffered. Here, the word amaivu [as in the first verse amaiththirundhOm] comes in the meaning of ‘desire’ with the variant samaivu. Since the word amaiyum would mean “not required”, the word amaiththirundhOm would mean ‘we did not need it’. This would convey the meaning that we did not require kaivailya mOksham (a variant of liberation in which the AthmA (soul), instead of enjoying emperumAn, enjoys itself) which is located in the outskirts of paramapadham and which is above the worlds of brahmA, rudhra, indhra et al. The implied meaning is that for us, who have thought of the consort of nappinnai, kaivalya mOksham, which excludes experience of emperumAn, is not required. Instead of this, we could also interpret the meaning in another way – we can consider viNNAttukku uchchamadhAm vIttai to refer to paramapadham itself. However, just as hanuman had said “Other than this physical form of a monkey which was embraced by SrI rAma, in whose auspicious qualities I had got engaged, with his divine form, I do not require the aprAkrutha (not related to primordial matter) form with which I have to enter paramapadham as there is nothing in paramapadham for me to enjoy”, we can consider that AzhwAr says “For me who has kept firmly in the mind nappinnaip pirAtti’s consort kaNNa, the experience of paramapadham is not required ”. Did not thoNdaradippodi AzhwAr too say in thirumalai 2 “ichchuvaithavira yAn pOy indhiralOgam ALum achchuvai perineum vENdEn aranga mAnagaruLAnE” (I will not like if I have to leave this experience of enjoying thiruvarangam even if I were to get the opportunity of going to paramapadham)! We will take up the 49th pAsuram next. This entry was posted in iyaRpA, periya thiruvandhAdhi on December 30, 2018 by T N Krishnan.